Does Acai Berry Help You Lose Weight? Acai Berry is a good healthy fruit and has come to notice because of its weight loss qualities’. But on the counter part there are no scientific evidences or proofs for the same. This article lets you know about the facts and myths associated with the fruit. Acai Berry is a small, round, black-purple berry sourced from Acai palm, and mainly grown in parts of Central and South America. It appears similar to the grape but is small and less pulpy. Its large single seed is used as dietary supplements. The reason for recent popularity of Acai berry is the wonderful weight loss benefits it brings along. 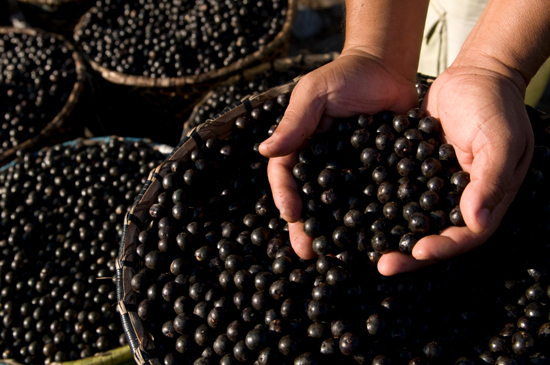 This article aims you to provide the facts of Acai Berry as a weight loss Supplement. It is popularly believed that Acai berry suppresses the appetite but it is a pure myth as there are no scientific studies to prove this thought. Cara Rosenbloom, a Toronto-based dietician and nutrition expert clearly states, “To date, there is no scientific evidence to support this claim”. Such claims are just fictional. There is no scientific evidence of such claim. Many people who have paid a good amount of money have been fooled. Such people are proof of fraud. The fraudulent claims have lower down the image of a good fruit. Acai Berry comes with the goodness of antioxidants, which is beneficial for your heart. It also delays the aging process and revitalizes the skin. Acai berry can be incorporated to weight loss food and used as a dietary supplement. But do keep in mind that it has not proved to promote weight loss.